A provocative collection of impassioned essays written from a radical, gay, African-American, feminist perspective. Smith, co-founder and publisher of Kitchen Table: Women of Color Press, has been publishing literary and social criticism for over 20 years. As a literary critic, she chastises the academic establishment for often misinterpreting and largely disregarding the voices of black women—gay black women in particular. In one of her most influential essays, “Toward a Black Feminist Criticism,” written in 1977, Smith, contending that “black women writers constitute an identifiable literary tradition,” pleads for a black feminist approach toward examining literature. Only the black feminist critic, she argues, is fully able to comprehend the nuances of work by black women, such as the depth of Sula and Nell’s relationship in Toni Morrison’s novel Sula. Smith is also critical of nonlesbians addressing the black lesbian experience. 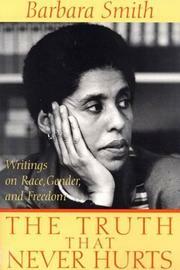 In “The Truth that Never Hurts,” published in the late ’80s, she argues that positive depictions of black lesbians are sorely lacking and that “far too many non-lesbian black women who are actively involved in defining the African-American women’s literary renaissance . . . completely ignore black lesbian existence or are actively hostile to it.” Smith’s equally fervent social and political writings are informed by a Marxist viewpoint. She argues, sometimes unpersuasively, that heterosexism and sexism can wither only when capitalism is destroyed. She’s especially concerned about the lack of role models for gay black youth; and she takes to task her gay brothers and sisters who have chosen to stay closeted because they are “more concerned with their individual security and careers than they are with building community and working for radical political change.” This manifesto is always challenging and often convincing.